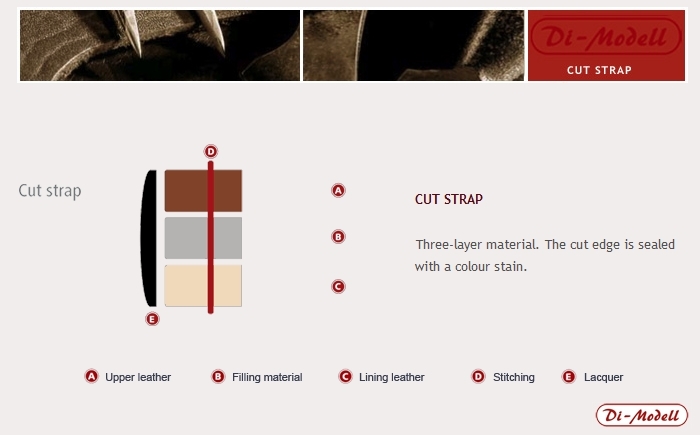 Most of our leather straps are of the "Cut Edge" type. These straps are made using genuine leather upper and lining with a filling material used to shape the strap. The edges of the strap are sealed with a colour stain. This is when a single piece of leather, or two pieces of leather are stuck together and the shape cut out. 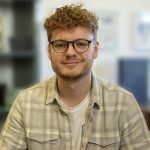 Many people will appreciate the potentially rough and natural look of a cut edge, however the main problem with this construction method is that it allows water and perspiration to easily penetrate the strap. This issue can be overcome by painting the edges of the strap to seal the cut edge of the leather. 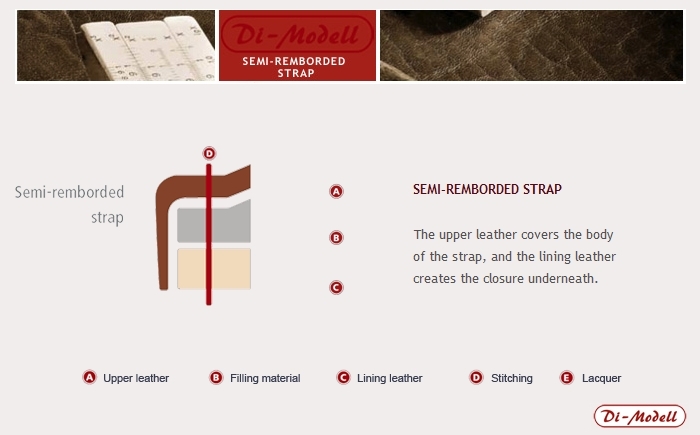 The Semi-remborde method is the next most used construction for our straps. The turned edge is a construction method were the top and bottom pieces are cut prior to gluing and then the edges of the strap are then pared, making them thinner. The edge of the top piece is then folded over the bottom piece, which is then glued onto the top piece. This technique allows straps to be produced in a wide variety of designs, and more aesthetically appealing than had been previously available with a cut edge type. It also reduces the chance of water and perspiration ingestion. However, there is a downside in that it makes the strap weaker and less durable as the leather has to be made so thin at the edges. A minority of our straps use the Remborde technique. The remborde edge strap uses a special adhesive applied to the leather, which is then allowed to dry. This adhesive is then reactivated later in the process. The top and bottom sections of the strap are cut out and then the special adhesive is applied to the inside surfaces of the leather. Both pieces of leather are then placed in a precision mould and a press is then used to bond the two pieces together under heat and extreme pressure. 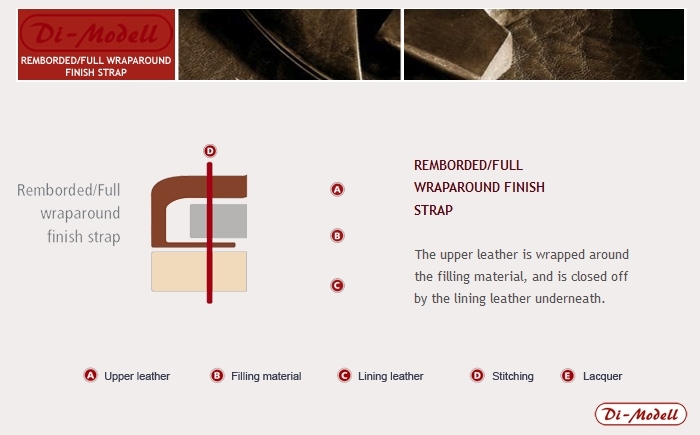 This process helps to mould the strap perfectly without weakening it in any way.